For the first few weeks of a kitty's life, water is unnecessary. Although water is essential to keep cats healthy and strong, they don't need it straight out of the womb. Newborn kittens are able to get all of the nutrition that they need from their mother's milk. If mama cat isn't around, then a kitten milk replacer shall do, too. 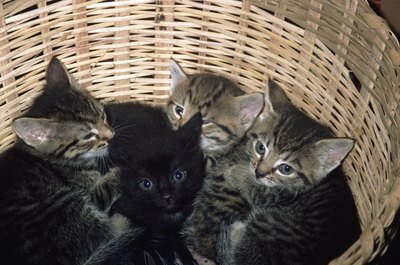 Up until kitties reach approximately 1 month in age, anything other than their mother's milk is totally unnecessary. No other sustenance -- not even water -- is yet required. The ASPCA states that this milk provides all of a kitten's required nourishment. This applies only to mom's milk though, as cow's milk can often lead to tummy distress and diarrhea troubles in kittens, so be careful and keep it away from them. In the event that the mother cat isn't available, commercial kitten milk replacers also can provide the little ones with their dietary needs. If possible, a foster mother cat for nursing purposes is even better! According to the ASPCA, queen cats typically begin the progressive weaning process when their litters are about 4 weeks old. Weaning doesn't just happen overnight, however, and often takes up to 10 weeks. By the end of the course, the kitties are usually consuming mostly solid and wet foods -- with a little bit of casual nursing here and there. The weaning process isn't just about kittens beginning to eat "normal" wet and dry kitten-specific, protein-rich foods. It's also about the very important introduction to drinking water. H20 is vital for keeping kittens healthy and lively. At around 4 weeks old, as soon as kittens start eating foods that aren't their mother's milk, it is crucial that the fluff balls always have clean water available to them -- in a shallow water bowl that is convenient to lap up, of course. If you're in charge of weaning duties, your first few attempts to encourage the wee ones to drink water may not be so easy. The kittens will probably end up with water splashed all over them and may start going into sneezing fits, but don't be surprised. Keep things tidy by putting some paper under the bowls -- you'll probably need it!